What if I told you Utah residents consume more JELL-O per capita than other other state in America? Or that Utah has its own JELL-O-themed legislation, including a statewide JELL-O week? Did you know that during the 2002 Olympic Games in Salt Lake City , there was on officially licensed JELL-O pin, celebrating the city and it's love of JELL-O? It is literally the official state snack of Utah. It would seem that nowhere in the world is JELL-O as celebrated as the beehive state. And Utah culture is intrinsically tied to Mormon culture, with 62% of the state's population confirmed to be members of the Church of Latter Day Saints. So in turn, the legend is born: Mormons love their JELL-O. Naturally, the reason Utah-ians (Utites? Utah-ers?) seem to have an ungodly love of gelatinous, no-bake piles of goo has everything to do with marketing, not much to do with faith... and literally zero to do with Bill Cosby (to the best of my knowledge). One theory is that Mormons indulge in the gelatin simply because they have to abstain from alcohol, coffee, and tea. JELL-O and its jiggly allure is one of the only acceptable vices for rebellious LDS teens. In reality, JELL-O was traditionally aimed at families. And that has more to do with the connection than any scripture. According to Christy Spackman's piece on Mormon cuisine stereotypes (specifically JELL-0), sales fell dramatically in the late 1970s. Desserts became more elaborate, structured affairs -- far from the quick and simple template that JELL-O was founded on. The company re-branded itself as a way to bring family members together with marketing campaigns featuring America's Dad, Bill Cosby (hindsight: yikes). As Mormons tend to have larger families -- their contraception limitations make the Catholic-Irish look like a Nelly video -- this was a natural fit, and a big opportunity for the flagging brand. Marketing was intensified in Utah, and kids who were generally prohibited from more scandalous, sugar-packed treats ate the stuff up. Like, actually ate the stuff up. At record clips. Mormon culture revolves around large gatherings -- where plenty of mouths need to be fed on a tight budget. As food writer and former Utah resident Scarlett Lindeman points out in an Atlantic article, the logistics of JELL-O (cheap, easily made, easily stored, lasts forever) just work with large-scale church functions. Also, molds can be fun! Wholesome fun! JELL-O, for its part, has done nothing but reinforce the connection with Mormons, and overall family wholesomeness. In the late '70s and early '80s, JELL-O shots and the rarely seen but much beloved "JELL-O wrestling" matches rose to prominence in sloppy frat houses around the country, giving JELL-O a negative association with debauchery... a decidedly un-family-friendly look. Naturally, the family-centric brand would much prefer being linked to a state known for being as straight-laced as Ned Flanders at a Wonderbread convention, rather than gratuitous drinking and naked wrasslin'. So, the company welcomed any link with Mormon culture. 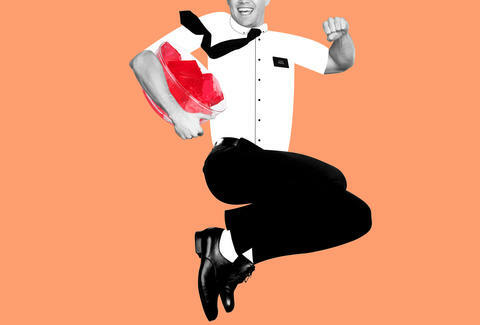 Stereotypes are generally offensive and often hurtful... and as Mormons have developed into a punchline of sorts, post-Book of Mormon and Mitt Romney, you can't help but feel a little for them. So, the stereotype continues to be perpetuated, and in many ways embraced. But it is important to remember this love of JELL-O isn't necessarily a product or idiosyncrasy of the religion, and more an expert marketing strategy based around a family-centric culture. And it's probably good for the brand, too.